- Analysis of Lidl's Marketing Strategy | 7Ps, SWOT - Custom Essay Writing Service UK for Your Academic Success! - Custom Essay Writing Service UK for Your Academic Success! Lidl’s history begins in the 1930s, when their first store was created in Germany acting as a grocery wholesaler. Since then, Lidl has now become one of the largest grocery retailers in Europe, with over 600 stores operating in the UK, and thousands based across Europe (Butler, 2014). Although the amount of stores that Lidl have in operation is staggering, it is made even more amazing by the fact they only expanded out of Germany 20 years ago (Lidl, 2015). This rapid expansion has made them one of the most dominant and feared competitors in the UK grocery market, with major grocery retailers constantly trying to minimise Lidl’s portion of market share. Although Lidl’s market share in the UK is still relatively small, with them acquiring 3.5% at the beginning of 2015, they are one of the fastest growing grocery retailers. Whilst many supermarkets are losing their market share, Lidl’s was increased by a stagger 15.1% from 3.1% to 3.5% (FT, 2015). Figure 1 highlights the variation in market share, and how much market share each supermarket currently holds. As previously mentioned, although Lidl have a relatively low market share, they are currently one of the fastest growing retailers in the market. An analysis of Lidl’s current marketing strategy will be conducted, with particular emphasis on the 7 P’s of marketing. Furthermore, Porter’s Generic Strategies will be analysed in order to aid in the understanding of Lidl’s current strategies. This will then be concluded with a SWOT analysis, with recommendations being drawn up via the utilisation of a TOWS matrix. The five core concepts of marketing are; consumer needs/wants/demands, products and services, value/satisfaction/quality, exchanges/transactions/relationships and markets (Kotler, et al., 2008). One of the most efficient ways to analyse these factors is to conduct a marketing strategy analysis, which looks to explore the strategies an organisation utilises in order to grow and expand their market share. In order to successfully analyse Lidl marketing strategy, a 7 P’s analysis can be conducted, which seeks to analyse some very basic, but significant issues. Originally, the 7 P’s was only comprised of 4 P’s which aimed to address certain issues that would allow a firm to have a more developed understanding of their internal operations. The 4Ps are comprised of; product, price, place and promotion (CIM, 2009). However, due to the limited applicability of the 4 P’s, three more were added to form the 7P’s, which aims to encompass some service qualities the 4 P’s do not cover (Booms & Bitner, 1981; Lusch, et al., 2007). Very solid brand name from being one of the cheapest supermarket retailers in the industry. Their main competition as a value supermarket is Aldi (Bosshart, 2006). The products sold in Lidl are often very similar to the goods sold in other supermarkets, such as Tesco or Asda. However, the main distinction would be the different brand names of the products in Lidl stores. Consumers could have a negative perception of the quality of Lidl’s products as they are sold for such a cheap price (Siro, et al., 2008). One of the key competitive advantages for Lidl is their clever pricing strategies. Lidl entered the market on the basis of being one of the most value-driven supermarkets in the industry (Dolgui & Proth, 2010). All payments are made up before leaving the store at the check outs. As they offer goods at an incredibly cheap price, consumers may believe that the goods they sell are poor quality, however this is generally not the case (Siro, et al., 2008). Lidl have a plethora of stores across the UK and Europe. However, depending on the country, they operate in different segments of the supermarket industry, ranging from value to high-end goods (Butler, 2014). They have a variety of distribution hubs across the UK and Europe to ensure that stores are maintaining a constant level of stock (Brown, 2015). As their business model is to sell as many goods as possible in the shortest amount of time, ensuring stock levels are maintained is incredibly important. This means that it is imperative to have stores in reasonably close proximity to national distribution centres. Lidl do not current have any loyalty schemes present in the UK, as they believe their pricing model is enough to incentivise consumers. Lidl often have in store promotions, but they do not discount their goods as highly as other retailers due to the low prices that already exist. Employees’ are generally paid a very attractive salary, but have to work incredibly hard whilst on the job. The amount of items scanned is often used as a performance measurement indicator (Ruddick, 2015). High training standards to ensure employees can scan items fast enough and meet all customer needs. Consumers may feel that staff do not pay them enough attention as they are very rushed doing their job responsibilities. Primary process of Lidl is to purchase and sell as many goods as possible on a low-cost basis. Consumers are not very involved in any of the processes or procedures of Lidl, and would have little power over their business operations. The majority of Lidl stores are laid out in a very linear and traditional manner. This is to aid consumers in finding their goods as soon as possible and having easy access to purchase and leave (Lidl, 2015). Lidl will often exhibit their brand colours, yellow and blue, throughout their stores or surrounding areas. This will help consumers know there is a Lidl nearby. Porter outlines four generic strategies; differentiation, cost leadership, differentiation focus and cost focus (Porter, 1980). From utilising the information gathered from the 7 P’s analysis, it becomes quickly apparent as to what strategy Lidl are currently pursuing. Lidl have a reliant focus on selling quality products at the cheapest cost possible. This would suggest that they are utilising a cost leadership strategy, and are implemented it with incredible effectiveness (Morschett, et al., 2006). However, in order to maintain their current rate of growth and expansion, Lidl may have to diversify from their current strategies in order to stay competitive and innovative within the UK grocery market. Based on the 7 P’s analysis, a SWOT analysis can be conducted in regards to Lidl. The SWOT analysis will help an organisation measure and understand the internal strengths and weaknesses, and the external opportunities and threats facing the firm. Being able to identify these elements will help an organisation to formulate and develop strategies which may build on the strengths, negate the weaknesses, exploit the opportunities or counter the threats (Dyson, 2004). Strong business structure allows them to sell their products at an incredibly cheap price. Wide range of private labels gives them exclusivity and security. Has a huge amount of stores across the whole of the UK and Europe giving Lidl great exposure. Online presence that showcases the products they have and any deals they may be running. 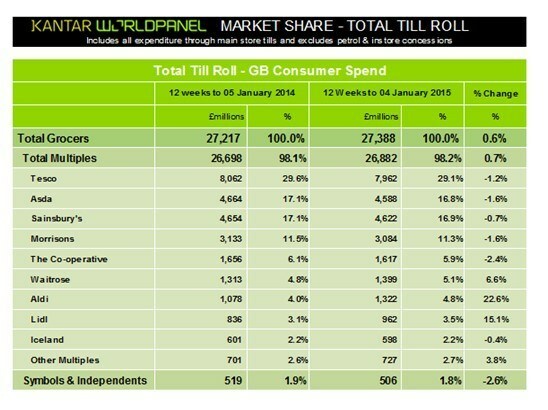 Does not quite have the market share of the other big supermarkets in the UK, such as Tesco or Asda. Has not been able to spread their operations outside of Europe very successfully. As their products are so cheap consumers can often think that the quality is not good enough. Potential to expand in the UK and acquire a higher share of the UK grocery market. Successfully expanding abroad can provide more funds to invest in the UK. Expand their website to actually accept orders and sell products. If Lidl were to engage with a price war with other major grocery retailers then they could force competitor’s prices down. International expansion of other global brands would cause more competition. Aldi surpassing their market share and becoming the dominant discount grocery retailer. Together with the SWOT analysis, a TOWS matrix can be utilised in order to develop strategies and recommendations for Lidl to acquire a greater market share of the UK grocery industry (Weihrich, 1982). Funnel revenue back into the UK market by creating more stores across the UK. Introduction of new product ranges that cater to an upper-class demographic. Cooperate with firms operating in the US or Asia to expand operations. Increased revenue could then be funnelled into UK development. Provide more information on their website about product details in order to enforce quality. Lidl’s own range of private brands can be used to deter price wars and comparisons. Avoid engaging in price wars and competitive with major grocery retailers on a direct basis. Utilise extensive network in of operations in other European countries to bring new products to the UK. Extend the usability of their website to accept click & collect orders or even delivery. This would expand their presence in the UK market. Develop and implement upper-class branded products in order to target a new demographic and compete with the major supermarket retailers on a more even environment. Construct firm barriers of entry to deter other organisations from entering the UK grocery market and potentially encroaching on Lidl’s market share. In order to stay competitive in the UK grocery industry, and continue to build upon their UK market share, Lidl should utilise the aforementioned strategies. Furthermore, this could result in them following a combination of generic strategies, as the introducing of upper-class brands, in combination with their current business structure, would suggest a differentiation strategy is in place. However, if Lidl pursue the adoption of other strategies, they must ensure that their current consumer base is not alienated, or they could end up losing market share. Furthermore, Lidl should continue to open more stores in the UK in order to expand their presence and accessibility, which will allow their operations to have similar exposure to the other major supermarket retailers. Bosshart, D., 2006. Cheap? : The Real Cost of Living in a Low Price, Low Wage World. London: Kogan Page Limited. Dolgui, A. & Proth, J. M., 2010. Pricing strategies and models. Annual Reviews in Control, 34(1), pp. 101-110. Dyson, R. G., 2004. Strategic development and SWOT analysis at the University of Warwick. European Journal of Operational Research, Volume 152, pp. 631-640. Kumar, N. & Steenkamp, J. B. E. M., 2007. Private Label Strategy: How to Meet the Store Brand Challenge. Cambridge: Harvard Business Press. Morschett, D., Swoboda, B. & Schramm-Klein, H., 2006. Porter outlines four generic strategies; differentiation, cost leadership, differentiation focus and cost focus (Porter, 1980).. Journal of Retailing and Consumer Services, 13(4), pp. 275-287. Porter, M. E., 1980. Competitive Strategy. s.l. :Free Press. Simon, H., Gathen, A. V. D. & Daus, P. W., 2010. Retail Pricing – Higher Profits Through Improved Pricing Processes. In: Retailing in the 21st Century. Berlin: Springer Berlin Heidelberg, pp. 319-336. Siro, I., Kapolna, E., Kapolna, B. & Lugasi, A., 2008. Functional food. Product development, marketing and consumer acceptance—A review. Appetite, 51(3), pp. 456-467. Weihrich, H., 1982. The TOWS Matrix — A Tool for Situational Analysis, San Francisco: Long Range Planning .